This study evaluated the cardiovascular/cerebrovascular safety profile of ranibizumab 0.5 mg vs. sham ± verteporfin in individuals with neovascular age-related macular degeneration. In addition, researchers compared ranibizumab 0.3 mg and ranibizumab 0.5 mg to 0.3 mg with sham. To the researchers’ knowledge, this was the largest patient-level pooled analysis of individuals with nAMD treated with ranibizumab. The researchers used patient-level pooled analysis of data from seven Genentech- and Novartis-sponsored Phase II, III and IV studies in nAMD completed by December 31, 2013. They performed pairwise comparisons (primary comparison: ranibizumab 0.5 mg [globally approved dose for nAMD] vs. sham or verteporfin) using Cox proportional hazard regression (hazard ratios, CIs) and rates per 100 patient-years. Standardized Medical Dictionary for Regulatory Activities queries and extended searches helped researchers identify relevant safety endpoints, including arterial thromboembolic events, myocardial infarction, stroke or transient ischemic attack, stroke (excluding TIA), vascular deaths and major vascular events, as defined by the Antiplatelet Trialists’ Collaboration. •	1.12 (CI, 0.64 to 1.98) for APTC events. HR CIs included one, indicating no significant treatment differences for all endpoints comparing ranibizumab 0.5 mg vs. sham or verteporfin. Researchers determined that rates of cardiovascular and cerebrovascular events were low in individuals with nAMD and not clinically meaningfully different for those treated with ranibizumab 0.5 mg vs. sham or verteporfin. They wrote that these findings supported the favorable benefit-risk profile of ranibizumab in individuals with nAMD. Furthermore, they added, pooling studies enabled an analysis with higher power and precision compared with individual study analyses. SOURCE: Zarbin MA, Francom S, Grzeschik S, et al. Systemic safety in ranibizumab-treated patients with neovascular age-related macular degeneration: A patient-level pooled analysis. Ophthalmology Retina 2018; June 11. [Epub ahead of print]. Researchers described the morphology of pigment epithelial detachment using optical coherence tomography angiography and investigated its potential to detect choroidal neovascularization in various types of PEDs. The retrospective study included 53 individuals diagnosed with PED after undergoing OCTA (AngioPlex, Cirrus HD-OCT) and spectral-domain OCT (Spectralis SD-OCT). •	four eyes (7 percent) had multiple PED subtypes. •	polypoidal choroidal vasculopathy (11.3 percent). •	four (100 percent) mixed PED eyes. Researchers concluded that OCTA successfully identified neovascularization in vPEDs and PEDs previously considered to be non-neovascular. However, they recommended that clinicians combine structural OCT and blood flow analysis to accurately interpret PED-associated neovascularization. SOURCE: Kang H, Byeon SH, Kim SS, et al. Combining en face optical coherence tomography angiography with structural optical coherence tomography and blood flow analysis for detecting choroidal neovascular complexes in pigment epithelial detachments. Retina 2018; May 8. [Epub ahead of print]. Investigators evaluated the use of optical coherence tomography angiography to detect choroidal neovascularization in eyes with indeterminate CNV features on conventional imaging, as part of a prospective, observational study of OCTA in individuals receiving routine spectral-domain optical coherence tomography for macular disease. Participants included those enrolled in the Observational Assessment of Visualizing and Analyzing Vessels with Optical Coherence Tomography Angiography in Retinal (AVATAR) Diseases. In the AVATAR participants, CNV was considered part of a differential diagnosis based on clinical exams, prior imaging or both, but presence of CNV wasn’t definitive on SD-OCT and fluorescein angiography imaging. Participants had all undergone imaging with the Avanti RTVue XR HD (Optovue) and the Cirrus HD-OCT (Zeiss) systems. Several researchers are consultants for Zeiss. Investigators assessed OCTA scans for the presence or absence of CNV. They evaluated spectral-domain OCT scans for the presence of fluid, hyperreflective material, serous pigment epithelial detachment, shallow irregular PED, vitreomacular adhesion, epiretinal membrane, retinal pigment epithelium atrophy and central subfield retinal thickness. They performed univariate and multivariate logistic regression analyses to identify features on SD-OCT associated with the presence of CNV on OCTA. Twenty-nine eyes of 29 individuals met the criteria for inclusion. A CNV lesion was detected on OCTA in eight eyes (28 percent), while 21 eyes (72 percent) showed negative results for CNV. After adjusting for age, gender and central subfield retinal thickness, the presence on SD-OCT of shallow, irregular PED (OR, 148; CI, 3.22 to 6830; p=0.011) and combination intraretinal fluid and sub-RPE material (OR, 16.8; CI, 1.43 to 198; p=0.025) was associated significantly with the presence of CNV on OCTA. Investigators found that OCTA enabled the identification of CNV that was otherwise indeterminate with prior imaging in select eyes. In addition, they determined that the presence of shallow, irregular PED as well as intraretinal fluid combined with sub-RPE material was associated with presence of CNV. Investigators suggested that OCTA might be a valuable adjunct to conventional SD-OCT and FA imaging in the detection and surveillance of CNV, particularly in diagnostic dilemmas. SOURCE: Atsuro Uchida, MD, PhD, Deepa Manjunath, BA, Rishi P. Singh, et al. Optical coherence tomography angiography in eyes with indeterminate choroidal neovascularization. Results from the AVATAR Study. Ophthalmology Retina 2018; June 1. [Epub ahead of print]. Scientists studied the development and progression of macular retinal pigment epithelial atrophy in eyes with neovascular age-related macular degeneration, and correlated the findings with visual acuity measurements, as part of a cohort study. Participants included Age-Related Eye Disease Study 2 participants with intermediate AMD enrolled in a randomized controlled clinical trial of oral supplements. Scientists conducted analyses in a subset of AREDS2 participants who were also enrolled in the fundus autofluorescence ancillary study. They assessed color photographs and FAF images in eyes with choroidal neovascularization, along with presence of geographic atrophy prior to CNV and development of macular atrophy after incident CNV. In addition, they measured hypoautofluorescence representing atrophy for area and macular involvement. And they analyzed the rate of atrophy and VA change over time. Incident CNV developed in 334 eyes (9.2 percent) evaluated in the AREDS2 FAF sub-study. Of them, 40 percent showed macular atrophy at incidence of CNV, with half of cases attributable to pre-existing GA. Atrophy developed in 14.7 percent of eyes over four years of follow-up. Mean area of atrophy was largest in eyes with pre-existing GA and CNV (5.17 mm2; p<0.001), and atrophy involved the center of the macula in more than 65 percent of eyes. Mean VA letter score at the annual visit in which CNV was documented was similar in the three atrophy groups: eyes with CNV and pre-existing GA, incident atrophy at the first visit with CNV and eyes with atrophy during follow up (60 letters). Rate of atrophy also was similar in the three groups (range: 1.23 to 1.86 mm2; p=0.47). Eyes with macular atrophy lost more VA compared with eyes without atrophy, particularly after two years of follow-up (-10.9 vs. -3.6 letters; p=0.07). Scientists concluded that presence of atrophy was common in neovascular AMD and often could be attributed to pre-existing GA. They added that macular atrophy and GA appeared to be a continuum of the same disease process, with both associated with poor vision. SOURCE: Domalpally A, Danis RP, Trane R, et al. Atrophy in neovascular age-related macular degeneration. Age-Related Eye Disease Study 2 Report Number 15. Ophthalmology Retina 2018; June 2. [Epub ahead of print]. Researchers classified retinal neovascularization in untreated early stages of proliferative diabetic retinopathy based on optical coherence tomography angiography, as part of a cross-sectional study. Thirty-five eyes were included. They underwent color fundus photography, fluorescein angiography and OCTA exams. Researchers used OCTA to assess neovascularization of the optic disc, neovascularization elsewhere and intraretinal microvascular abnormalities. They evaluated the origin and morphology of NVD/NVE/IRMA on OCTA, and measured retinal nonperfusion areas using Image J software. Researchers captured 35 NVDs, 75 NVEs and 12 IRMAs in 35 eyes, and identified three proposed subtypes of NVEs based on origins and morphological features. •	Type 1 (32 of 75, 42.67 percent) originated from retinal vein structures in a tree-like shape; type 2 (30 of 75, 40 percent) originated from capillary networks, with an octopus-like appearance; and type 3 (13 of 75, 17.33 percent) originated from the IRMAs, having a sea fan shape. •	NVDs originated from the retinal artery, retinal vein or choroid, and arose from the bending vessels near the rim of the optic disc. •	IRMAs originated from, and drained into, retinal venules extending into the retina. The initial layer and affiliated NPAs were significantly different in the three subtypes of NVEs (all p<0.01). Researchers wrote that OCTA enabled identification of the origins and morphological patterns of neovascularization in PDR. They added that the new classification of retinal neovascularization might be useful to better understand pathophysiological mechanisms and guide efficient therapeutic strategies. SOURCE: Pan J, Chen D, Yang X, et al. Characteristics of neovascularization in early stages of proliferative diabetic retinopathy by optical coherence tomography angiography. Am J Ophthalmol 2018; May 26. [Epub ahead of print]. Scientists examined the relationships between retinal vessel geometry and the incidence and progression of diabetic retinopathy, as part of an observational, prospective cohort study. A total of 996 individuals with type 1 diabetes mellitus, and 1,370 people with type 2 diabetes mellitus at a baseline exam were eligible for follow-up exams at five-year intervals. A total of 3,846 person-interval data from these follow-ups were the basis for the analyses. Scientists graded 30-degree stereoscopic color fundus photographs to assess DR and macular edema. They analyzed retinal vessel geometric characteristics using the Singapore I Vessel Assessment program from a digitized copy of one field 1 fundus photograph obtained at baseline and follow-up. Main outcome measures included the five-year incidence of DR, progression of DR, incidence of proliferative DR and clinically significant macular edema in right eyes. •	Incident DR occurred in 45 percent of eyes, progression occurred in 32 percent, PDR was found in 10 percent and CSME was detected in 5 percent of eyes. •	While adjusting for glycated hemoglobin, duration of diabetes and other factors, retinal arteriolar simple tortuosity was associated significantly with the incidence of DR (OR, 1.17; CI, 1.01 to 1.35). •	Retinal venular branching angle was associated significantly with progression of DR (OR, 1.18; CI, 1.03 to 1.36). •	Retinal venular curvature tortuosity was associated significantly with incidence of PDR (OR, 1.15; CI, 1.01 to 1.30). •	Retinal venular branching angle (OR, 1.41; CI, 1.10 to 1.82) was associated significantly with the incidence of CSME. •	No significant associations of other RVGCs with DR outcomes in the full multivariate model were found. •	Inclusion of all possible RVGCs didn’t improve the predictive value of the models that already included retinal vessel diameter and baseline DR severity level. Scientists found that geometric characteristics of retinal venules were associated with progression of DR. However, they also determined that most RVGCs measured from digitized fundus photographs added little to the assessment of risk of incidence and progression of DR when other risk factors were considered in type 1 diabetes mellitus and type 2 diabetes mellitus. Source: Klein R, Lee KE, Danforth L, et al. The relationship of retinal vessel geometric characteristics to the incidence and progression of diabetic retinopathy. Ophthalmology 2018; May 17. [Epub ahead of print]. Investigators aimed to determine whether the presence of vitreomacular interface abnormalities in individuals with diabetic macular edema would modify the response to ranibizumab. •	and BCVA, CRT and presence/absence of fluid at the last follow-up. A masked investigator reviewed and graded OCT scans for the presence/absence of VMIAs at baseline and follow-up, and for changes in the posterior hyaloid face during follow-up. •	previous cataract surgery (p=0.01). Multivariable regression analyses didn’t disclose statistically significant associations between VMIAs at baseline, changes in the posterior hyaloid face during follow-up, or in functional/anatomical outcomes following treatment. Researchers determined that VMIAs were associated with worse presenting vision in individuals with DME. Furthermore, they added, that VMIAs or changes in the posterior hyaloid face during follow-up didn’t modify responses to ranibizumab. SOURCE: Mikhail M, Stewart S, Seow F, et al. Vitreomacular interface abnormalities in patients with diabetic macular oedema and their implications on the response to anti-VEGF therapy. Graefes Arch Clin Exp Ophthalmol 2018; May 19. [Epub ahead of print]. Researchers aimed to determine whether disorganization of retinal inner layers (DRIL) on optical coherence tomography was associated with ischemia on ultra-widefield fluorescein angiography and with visual outcomes in eyes with acute, treatment-naïve central retinal vein occlusion, as part of a retrospective, single-institution, longitudinal cohort study. Twenty-five consecutive cases with treatment-naïve CRVO and more than one year of follow-up were included. Two independent masked graders evaluated the extent of DRIL, ellipsoid zone disruption, external limiting membrane disruption and other OCT parameters at baseline, six- and 12-month visits, and final visit. Baseline UWFFA images were assessed for ischemic index values and foveal avascular zone enlargement. Main outcome measures included associations of DRIL with UWFFA findings and clinical outcomes including corrected visual acuity. The median time to final follow-up was 24 months (range: 12.1 to 43.9 months). Median DRIL extent at baseline was 765 μm (range: 0 to 1,000 μm). Eighteen of 25 eyes (72 percent) had some degree of DRIL at baseline, and 20 of 25 eyes (80 percent) had cystoid macular edema. Neither the presence nor extent of DRIL at baseline were associated with presenting VA. In a cross-sectional analysis, extent of DRIL correlated with worse VA at the six-month visit (ρ=0.656; p=0.001) and final (ρ=0.509; p=0.016) visit. At final follow-up, DRIL extent was the OCT parameter most strongly correlated with baseline ischemic index (ρ=0.418; p=0.047) and enlarged FAZ (p=0.057) on UWFFA. On multivariate regression analysis, DRIL extent at final follow-up was the only OCT parameter associated with worse VA (p=0.013) and remained significant when accounting for CME as a potential confounder. Scientists found that the extent of DRIL wasn’t associated with presenting of VA in treatment-naïve eyes with acute CRVO. However, they determined that after six months of follow-up, DRIL severity correlated with worse VA and was predictive of worse VA throughout more than two years of follow-up. Scientists concluded that ischemic features on UWFFA at baseline were predictive of the extent of DRIL development at final follow-up. SOURCE: Berry D, Thomas AS, Fekrat S, et al. Association of disorganization of retinal inner layers with ischemic index and visual acuity in central retinal vein occlusion. Ophthalmology Retina 2018; June 08. [Epub ahead of print]. Individuals with exudative maculopathies (neovascular age-related macular degeneration, diabetic macular edema and retinal vein occlusion) are faced with burdensome exams and treatments. As such, researchers aimed to analyze the accuracy of subjective evaluations of visual acuity and metamorphopsia to detect disease reactivation compared with spectral-domain optical coherence tomography to assess morphological signs of reactivation. Researchers conducted a retrospective study of 888 individuals treated for nAMD (n=638): DME (84); BRVO (110); and CRVO (56). They compared subjective evaluations (i.e., change of VA and/or metamorphopsia) against clinical evaluations via SD-OCT of disease activity. And they calculated sensitivity and specificity, and negative and positive predictive values for detection of active disease. They also analyzed via regression analyses false-negative subjective evaluations. The sensitivity of subjective evaluations to detect disease reactivation was <0.50 in all exudative maculopathies. Sensitivity was increased to ≥0.60 by combining subjective worsening with one lost line in the VA test in RVO, but not in DME and nAMD. The specificity was >0.85 in all individuals, and the positive predictive value was >0.85 in people with RVO. Regression analyses didn’t reveal any factors that could reliably identify subgroups in which OCT could be omitted, although CRVO subjects with a VA of <0.3 logMAR had an odds ratio of 0.20 for false-negative subjective evaluations (p=0.009). Researchers found the accuracy of subjective evaluations to discriminate disease activity in individuals with different exudative maculopathies was low and didn’t substitute for frequent SD-OCT exams. They added that routinely assessed clinical parameters such as age, VA or treatment experience weren’t useful to predict the validity of subjective evaluation of disease activity. SOURCE: Bruender M-C, Benjamin N, Hansjuergen TA, et al. Subjective evaluation of visual acuity is not reliable to detect disease activity in different exudative maculopathies. Graefes Arch Clin Exp Ophthalmol 2018; June 1. [Epub ahead of print]. Researchers studied the incidence of endophthalmitis after pars plana vitrectomy, its causative organisms and visual acuity outcomes in a retrospective, comparative study. They reviewed the medical records of individuals with acute-onset postoperative endophthalmitis after PPV at Farabi Eye Hospital, Tehran, Iran, during a 12-year period between January 2004 and November 2015. They developed a control group by gathering the data from surgical records to compare the endophthalmitis cases with other cases that underwent PPV on the same day in the same operating room. The incidence rate of post-vitrectomy endophthalmitis was 0.04 percent (16/39,783). The organisms identified in aqueous or vitreous cultures (culture positive: 44 percent) included Streptococcus pneumoniae (two individuals, 12.5 percent), Pseudomonas aeruginosa (two individuals, 12.5 percent), fungi (two individuals, 12.5 percent), and Streptococcus viridans (one individual, 6.25 percent). Visual acuity after treatment for endophthalmitis ranged from light perception (seven eyes) to hand motion (one eye), and evisceration was performed in eight eyes (50 percent). When comparing cases (individuals developing endophthalmitis) and controls (subjects with no complications operated on the same day and at the same place as the case group), not using tamponade showed a statistically significant relationship with the occurrence of endophthalmitis (p=0.034). Researchers determined a low incidence of endophthalmitis after PPV comparable with previous studies that had resulted in poor visual acuity. They speculated that the lack of a tamponade might have increased the risk of endophthalmitis among subjects. SOURCE: Tabatabaei SA, Soleimani M, Vakili H, et al. The rate of endophthalmitis after pars plana vitrectomy and its risk factors. Int Ophthalmol 2018; May 11. [Epub ahead of print]. Optovue’s AngioAnalytics, which the company says is the world’s first optical coherence tomography angiography blood vessel measurement technology, received FDA 510(k) clearance. The company’s three-dimensional projection artifact removal software, designed to improve OCTA image quality for accurate measurements and image interpretation, also got clearance. The company says AngioAnalytics is intended to bring objective data and analysis to AngioVue OCTA technology through high-resolution imaging of retinal blood vessels. Combined, the two newly approved technologies create color-encoded maps of the vessel densities of the retina or optic nerve, and provide analyses of non-perfusion, flow areas and parameters to assess changes in the foveal avascular zone. Read more. Nexy, a new FDA 510(k)-cleared, CE-marked retinal camera, features fully robotic operation designed to yield clear and detailed retinal images, says its maker Next Sight (Prodenone, Italy). Next Sight says the camera uses technology to drive a “value-priced” retinal exam in which a minimally trained operator can acquire virtually hands-off images. Nexy is being used in Europe for diabetic eye-screening and other health-care initiatives to provide access to care in minimally served locations through an optional service in which an expert can read securely distributed images. This telemedicine feature may also be used to integrate with artificial intelligence-processing engines to extract additional information from retinal imaging. Nexy is distributed in the United States by Konan Medical. Read more. BioTime received a new grant of up to approximately $1.9 million from the Israel Innovation Authority for continued development of OpRegen. The company is currently in a Phase I/IIa clinical study, which in March 2018 received authorization from the Data Safety Monitoring Board to enroll cohort 4 based on safety observed throughout the first three cohorts. 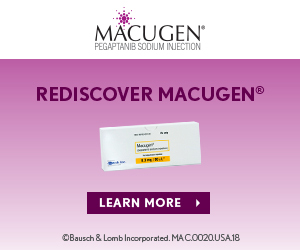 OpRegen is being studied for the treatment of dry AMD, and consists of a suspension of retinal pigment epithelial cells delivered subretinally during an intraocular injection. Read more. Salutaris Medical Devices treated the first subject in a multicenter clinical trial investigating the use of its ophthalmic brachytherapy device to help treat neovascular age-related macular degeneration. Salutaris says the first procedure using the device was performed May 9 by Gregg Kokame, MD, principal investigator at Retina Consultants of Hawaii in Honolulu, without complication, and was well-tolerated by the subject. The trial has the primary objective of determining the safety of the SMD-DA system concomitant with an anti-VEGF treatment regimen. Read more. In TYBEE—a multicenter, randomized, masked, controlled Phase II trial—71 individuals who were treatment-naïve for diabetic macular edema were randomized 1:1 to receive quarterly treatments of suprachoroidal triamcinolone acetonide (CLS-TA) with intravitreal Eylea (months zero and three) or four monthly treatments of intravitreal Eylea plus a sham suprachoroidal procedure (months 0, one, two and three); individuals in both arms received intravitreal Eylea treatments at months four and five as needed. Clearside Biomedical announced the trial met its primary endpoint of mean improvement in best-corrected visual acuity from baseline over six months using the Early Treatment Diabetic Retinopathy Trial scale. Individuals in the combination arm gained an average of 12.3 ETDRS letters compared with 13.5 ETDRS letters in the Eylea-alone control arm (p=0.664). Read more. PanOptica dosed the first patient in a Phase I/II dose-ranging clinical trial of PAN-90806, a once-daily topical eye drop formulation of a small-molecule anti-vascular endothelial growth factor for the treatment of neovascular eye diseases. The company is investigating its new suspension formulation as monotherapy for up to three months in a masked study involving 60 individuals newly diagnosed with neovascular age-related macular degeneration randomized to one of three dose strengths at sites in the United States and the European Union. Read more. • was well-tolerated, with no serious adverse events. Read more. Nidek introduced the LSFG-RetFlow Laser Speckle Flowgraphy for noninvasive, real-time imaging and measurement of ocular blood flow, to aid in the clinical evaluation of glaucoma and retinochoroidal vascular disease. The technology provides 16 indices of the retinochoroidal vascular dynamics based on the Mean Blur Rate, which measures relative blood flow velocity and correlates to the actual rate of blood flow. The MBR is presented in a color-coded map for evaluation of the onset, progression and follow-up of disease. Practitioners can select indices that meet their clinical needs, and the instrument design is intended to ensure patient comfort, Nidek says. Read more. A research team led by the University of Wisconsin-Milwaukee developed a unique imaging technique to identify biomarkers of cellular damage occurring in mice that drive disease progression. Results showed that the retina’s photoreceptors were the most susceptible cells to damage at disease onset. The study, conducted with researchers at the McPherson Eye Research Institute at UW-Madison, confirmed earlier research suggesting that retinal deterioration occurred at irregular intervals and that significant cell damage happened within the first three months. Researchers said that understanding processes occurring at the cellular level could lead to more effective treatments or earlier diagnoses. Read more. The Foundation Fighting Blindness and CheckedUp formed a collaborative partnership to deliver diagnostic and disease-management information to individuals with retinal diseases during eye-doctor visits. FFB will provide visual and audio content on retinal conditions, and resources on research and emerging therapies through CheckedUp's patient engagement technologies. Read more. Heidelberg Engineering’s next-generation OCT2 Module will be installed on the International Space Station in late 2018. The device was onboard the Antares 230 Cygnus CRS OA-9, when it launched May 21, 2018, from Wallops Island, Va. Researchers will continue to study Space Flight Associated Neuro-Ocular Syndrome, as well as changes in posterior optic nerve head anatomy and choroidal blood supply to the retinal structures. Read more. Alabama-based company OcuMedic says that a new, drug-eluting soft contact lens technology has been shown to deliver various drugs directly to the eye, and it has plans to begin clinical trials of the technology in the coming year. The extended-wear contact, developed by biomedical researchers at Rowan University and Auburn University, controls the release of anti-inflammatory, antibiotic and pain-reducing drugs delivered evenly over time. OcuMedic says the technology can potentially reduce recovery time and postoperative complications after eye surgery. Read more.